TB is the world’s most lethal infectious disease, with over 10 million new cases each year, an estimated 1.8 million deaths annually. Unfortunately, people who use drugs (PWUD) tend to have higher rates of TB and higher prevalence of latent TB infection. Lack of follow-through on medical examinations and referrals and lack of integration between various medical and public health services are key barriers to successful diagnosis and treatment. A fully Funded Global Fund in 2019 would mean critical programs targeting key populations such as drug users could be implemented and sustained. GFAN’s Get Back on Track Report released earlier this year, calls for a funding increase of more than 20% to the Global Fund to Fight AIDS, Tuberculosis and Malaria in its Sixth Replenishment – which includes a doubling of current Global Fund spending on TB – to ensure a fund of between $16.8 and $18 billion for 2020 to 2022. Last month’s historic HLM saw advocates from around the world gather in New York to speak to world leaders about the importance of addressing the TB epidemic at the United Nations High Level Meeting on TB. One of those advocates was GFAN Speaker Anton Basenko, who works in his home country of Ukraine on the international advocacy project PITCH and coordinates harm reduction programmes that target drug users. How long where you in New York? Did you attend any other meetings other than the HLM? I was there for 4 days and attended both the pre and post HLM civil society meetings and the Leave no One Behind side-event. What do you think was the most important or impactful part of your visit and why? My speech on the Leave No One Behind side event was the most impactful part of my visit because it was unique opportunity to address, in person, my communities’ issues to the high-level people attending the meeting including: The Global Fund, PEPFAR, USAID, UNAIDS, WHO, UN Special Envoy on TB, Member-States and Donor Countries. Because there were so many key organizations and top people at the meeting, I tried to focus on a few key messages. I spoke about the difficulty for drug users accessing TB treatment and described the locked cycle of drug use and TB. There is a double stigma for drug users with TB and this creates even more discrimination. During my speech I tried to address each organization in the room. 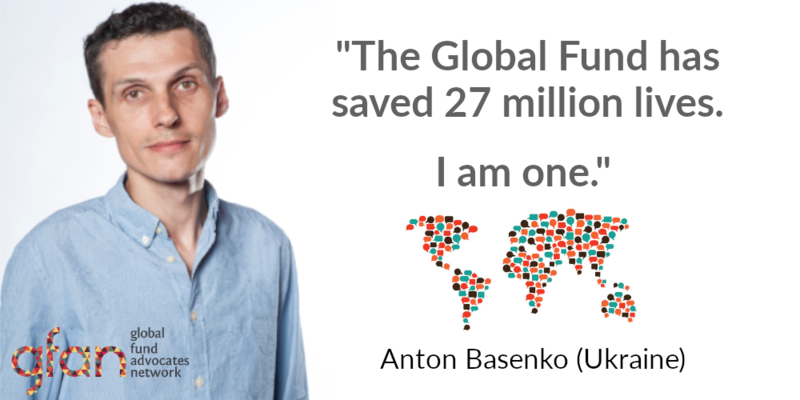 My message to the Global Fund, was a congratulations on the work they have done, and a thank you from me, as thanks to the Global Fund my life was saved. But, I pointed out that there is still work to be done because it is harder to reach people with TB, in particular those countries in transition away from Global Fund funding, like the Ukraine. I reminded those in the room that we have good examples of different sectors working together with meaningful involvement of key populations in the decision-making processes which is CCM (Country Coordination Mechanisms) . This kind of work should be continued. Finally, systemic barriers like criminalization prevent us from finding TB cases. Drug users will not access medical help as they see it as part of the system that discriminates against them. I was touched by the comments from other speakers regarding the work I do and I am glad I could share my story. Was there anything that you learnt from meeting with people that you think would be useful to share with other members of the GFAN family? To my mind TB HLM is a good lessons-learned event from all previous HIV/AIDS HLMs. I participated in previous HLMs for AIDS and was a member of the stakeholders taskforce that prepared the 2016 HLM. During that HLM I realized there was something wrong, heard words without action from many ministers and world leaders. There were no real conversations about what was happening in countries. The political declaration, in my opinion had many compromises but has lost many important things like Harm Reduction and OST. The HLM for TB was different, it seems lessons were learned from the HLMs on HIV. The efforts everyone put in before the HLM really showed. The TB declaration was much more progressive and had fewer compromises. Next steps were ready as soon as the political statement was released. One TB survivor from India, Nandita Venkatesan, in her call for support for not only TB survivors but also caregivers was vey powerful. Her message was very important, and she received a standing ovation from the entire room, from the diplomats and ministers and civil society observing. Her message really stood out to me. Why was attending the HLM TB important to you? 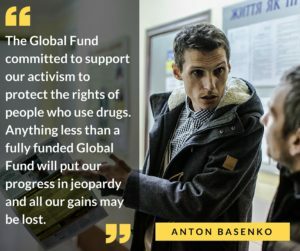 Because People who use drugs in Ukraine and globally are still burdened from TB and still “missed cases’ because of systematic barriers like criminalization, stigma and discrimination. 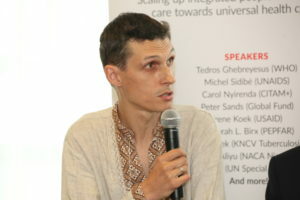 It is always important for people from Eastern Europe and Ukraine to speak about TB. Ukraine is still one of the leaders for TB infection and TB/HIV infection. It is important that someone from the drug user community is heard by leaders. There is still a problem with access to diagnostics and treatment for the drug user community, and it is extremely important to hear these voices. The HIV HLM seems to happen only every 5 years. So, these HLMs are very valuable for advocacy to outline and highlight challenges. Did you meet anyone new? Can you share something from those conversations? Almost 70 people spoke during the opening, plenary and closing segment. A few people who spoke really stood out. One person was the Minister of Health from Belgium, whose words were different from the other speeches and her message was inspiring. She outlined the supports available to TB patients in addition to medical treatment and the success of this approach. I was able to meet the Minister and have a brief discussion and I shared wither her the idea of an experience exchange with Ukraine. I also spoke to the Ukrainian Parliamentarians about their position on decriminalization of PWUD. Being close to the official delegation and decision makers from Ukraine was a good opportunity to make linkages with them and formally or informally discuss issues. We don’t always have an opportunity to meet and have these discussions in Ukraine. I was pleased to explain the link between drug users and TB and I feel like I planted a small seed in the soil and hope that an activist plant grows. Two weeks following the HLM on TB we had our fist conference in Ukraine for the TB community and survivors. It was a great opportunity to share messages from the HLM. To learn more about the need to get back on track to end the epidemics see GFAN’s Get Back on Track Report and read more about TB Key Populations and the critical need to increase support to ensure these communities will not be left behind in our TB Key Populations Report.